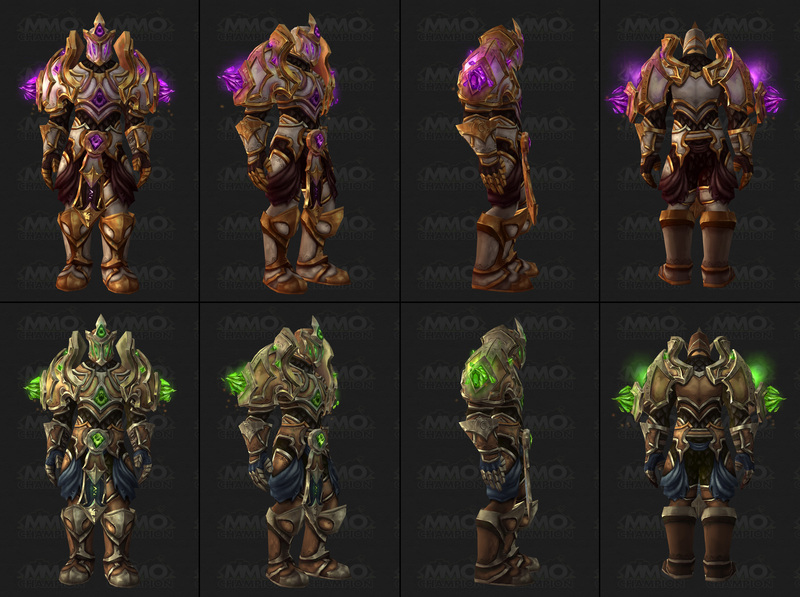 The first Warlords of Draenor tier set is here! This set is a WORK IN PROGRESS and has some issues with the belt clipping. The final version may look significantly different, so consider this a sneak peek and not final preview. We've also streamlined the multitude of various types of Haste % and Crit % bonuses. Spell Haste %, Melee Haste %, and Ranged Haste % have been merged into a universal Haste %. We’re making a number of changes to itemization based on a single philosophy: We want to increase the chance that any given item drop is useful to someone in your group.To support this philosophy we’re making a few changes to stats. Most items found in Draenor will work for all specializations within a given class, so that you never have to grumble when you see, for example, Intellect plate drop in a group that lacks a Holy Paladin. We’re also reducing the number of role-specific stats: Hit and Expertise are gone, as are Dodge and Parry as stats on items, replaced with a single tank stat of Bonus Armor. Armor and Spirit will be specific to tanks and healers respectively, but all other secondary stats will have universal appeal. Because of the magnitude of this change, we’re retroactively applying this philosophy to items in Mists of Pandaria. After the pre-expansion patch you may find that some of your items contribute different stats, but they should still be good for your class. Multistrike: Grants a chance for spells and abilities to fire an additional time, at 30% effectiveness (both damage and healing). Readiness: Reduces the cooldown of several class abilities with long-cooldowns. Hit and Expertise on all items have been replaced with a universally useful secondary stat. Stats that are not useful to your current class specialization will be grayed out in the tooltip rather than green, and will not be counted on your character stat sheet. For example, Intellect on a cloak will be greyed out for all Warrior specializations and they will not receive an increase to Intellect if equipped. However, if the same cloak is equipped by a Mage, Intellect will show up as green and they’ll receive the increase to their Intellect. Head, Chest, Hand, Wrist, Waist, Leg, Feet, Weapon, Shield, and Off-hand items that had tanking stats (Dodge, Parry) or healer stats (Spirit) have been replaced with a different universally useful secondary stat. Plate Armor pieces will always have Strength and Intellect on it. Mail and Leather Armor pieces will always have Agility and Intellect on it. Shadow Word: Death is now available only to Shadow Priests. Discipline and Holy Priests can add a self-damaging utility to Holy Fire through a new Major Glyph. Flametongue Weapon is no longer available to Restoration Shaman, and only causes damage on weapon swings for Enhancement Shaman. Frostbrand Weapon has been removed. is now available only to Enhancement Shaman. Searing Flames has been removed. Flametongue Weapon damage has been increased by 40%, and Lava Lash damage has been increased to 280% weapon damage (up from 140%) to compensate. Water Shield is now available only to Restoration Shaman and replaces Lightning Shield. Demonic Breath has been removed. Howl of Terror is now a Level-30 talent, replacing Demonic Breath. Additionally, we've significantly reduced the number of throughput-increasing cooldowns and procs, in order to further reduce burst damage. Please keep in mind when reading the specifics of the patch notes that some classes may have lost abilities, or had the power of select abilities reduced. These changes were made in the context of the above goals. Other classes have a reduced crowd-control ability overall. We believe that this entire package of changes will make PvP a more enjoyable experience for everyone. Rune of Swordbreaking has been removed. Rune of Swordshattering has been removed. Cyclone now shares Diminishing Returns with Fears, and can be canceled by immunity effects (i.e. Divine Shield, Ice Block, etc. ), and can be dispelled by Mass Dispel. Disorienting Roar has been renamed to Incapacitating Roar, incapacitates enemies instead of disorienting them, and its effect now shares Diminishing Returns with other Mesmerize effects. Moving quickly has always been a powerful bonus in World of Warcraft; however, the logic of how various movement speed bonuses stack (or don't) has generally been inconsistent and poorly explained. Under the old set-up, each movement speed bonus would become more powerful when combined with another, so we would limit what can stack with what, and prevent certain abilities from being used when another one is already in effect. We decided to change the movement speed system to make it more transparent, with rules about stacking that are easier to understand, and with fewer restrictions. Previously, multiple movement speed modifiers on you were multiplicative, meaning that if you had two different +25% movement speed bonuses, they resulted in a total movement speed of 56% (1.25*1.25 = 1.56). Movement speed bonuses have been changed to be additive. The previous example with two different +25% movement speed bonuses would result in a total movement speed of +50%. The logic governing which bonuses stack with others has been simplified as well. "Movement speed bonuses have been changed to be additive." If a bonus is self-only and passive, it now stacks additively with everything. If a bonus is temporary or applies to other players, it's considered exclusive, and the character only gains the benefit of the highest exclusive bonus. Additionally, restrictions that prevented a player with a temporary speed bonus from receiving or activating a second temporary speed bonus have been removed. Both bonuses will now apply to the character, but only the one with the highest magnitude will have any effect. These will all stack additively with each other. All of these effects can now be applied simultaneously, but only the strongest one will have an effect. Various classes bring various abilities that provide utility to parties and raids. We talked about one type of utility in the Buffs and Debuffs section, above. However, there are other types of raid utility, and it’s been in need of more attention. In general, raid utility, especially raid-wide defensive cooldowns, had grown too strong. So many classes and specializations had defensive cooldowns that we had to make raid damage extremely high, as raids would be stacking or chaining together multiple cooldowns. We'd like to return to a system where it's the healers who heal through the scary moments, not the damage dealers, for example. To do so, we’ve established a new baseline level of raid utility that a specialization should bring, and brought everyone to that new standard by reducing the effects of some abilities, or removing some abilities altogether. Anti-Magic Zone now reduces magic damage taken by 20% (down from 40%). Tranquility is now only available to Restoration Druids. Amplify Magic is a new spell available to Mages. Amplify Magic amplifies the effects of helpful magic, increasing all healing received by 20% for all party and raid members within 100 yards, and lasts 6 seconds with a 2-minute cooldown. Avert Harm has been removed. Stance of the Fierce Tiger’s movement speed increase now affects the Monk and all allies within 10 yards. "...we’ve established a new baseline level of raid utility...by reducing the effects of some abilities, or removing some abilities altogether." Devotion Aura is now only available to Holy Paladins. Hymn of Hope has been removed. Smoke Bomb now reduces damage taken by 10% (down from 20%). Ancestral Guidance now causes 20% of damage or healing to be copied as healing to nearby injured allies (down from 40% of damage or 60% of healing). Healing Tide Totem is now available only to Restoration Shaman. Stormlash Totem has been removed. Each player can use a Demonic Gateway only once every 90 seconds. Healthstones now share a cooldown with Health Potions, separate from other potions. There are many effects in the game which deal periodic damage over time (DoT) or healing over time (HoT). Historically, these have typically done something called “snapshotting”; they were based on your stats at the time that they were cast, and that was used for calculating their effect for their full lifetime. In Mists, if a warlock casts Corruption on an enemy while Heroism is active, that DoT will continue to tick rapidly based on the temporary haste effect, even after Heroism fades. This has led to some gameplay that has both good and bad sides. Snapshotting encourages refreshing those periodic effects when your stats are high, such as when a temporary buff procs. On the upside, there's a high amount of skill involved in maximizing that. On the downside, it's not intuitive, and the skill ceiling is so high that few can reach it without the use of specialized add-ons. To make matters worse, the benefits of maximizing periodic snapshotting is so high that it creates a balance problem. Players maximizing periodic snapshotting (primarily through the use of add-ons) do drastically more damage than intended. If we balance around taking full advantage of snapshotting, then the players who aren’t doing so would fall unacceptably far behind in damage output. Ultimately, we've decided that snapshotting isn't a productive mechanic for the game. The vast majority of periodic effects in the game that snapshotted no longer do so. The only exceptions are ones that do damage based on a percentage of a previous ability's damage (such as the Ignite from a Fire Mage's Fireball, or the periodic damage on a Windwalker Monk's Blackout Kick), as they inherently act as a delayed damage multiplier to those abilities.Temporary effects which buff the damage or healing of other spells specifically will continue to do so for their lifetime; for example, Unleash Flame (which increases the damage of the shaman's next fire spell by 40%), when used on a Flame Shock, will continue to increase the damage of the periodic effect for its entire lifetime, despite being consumed when the Flame Shock is cast. "The vast majority of periodic effects in the game that snapshotted no longer do so. The only exceptions are ones that do damage based on a percentage of a previous ability's damage..."
We still of course want skills and their use to embody interesting choices, and intelligent and skillful use of abilities. Periodic damage and healing effects now dynamically recalculate their damage, healing, Critical chance, multipliers, and period on every tick. Skilled players will still be able to take advantage of temporary power buffs like trinket procs, and you'll still want to cast your hardest hitting spells within those proc durations. The benefits just won't extend outside the trinket procs’ duration. As such, this high-skill gameplay is there, it's just rewarded more consistently. For example, a Priest’s trinket procs and an already active Shadow Word: Pain will begin dealing more damage the instant the proc effect occurs, but will return to normal when the proc duration ends. Skilled players will be able to play within these proc durations to maximize effect, but it won’t be as detrimental to output to anyone who isn’t actively and skillfully using them to their full extent. We also made another change to periodic effects. Haste has long affected the tick rate of periodic effects, and their duration has been rounded to whole numbers of ticks, in order to mostly preserve the original duration of the spell. This lead to Haste breakpoints where having specific amounts of Haste would cause certain periodic effects to gain an extra tick. Part of gearing your character involved trying to reach those Haste breakpoints, but not go over by too much. This was a fairly tedious number to manage, which was again mostly handled by add-ons and guides. With some new tech we’re now able to calculate the effect of Haste on tick time dynamically. Any fraction of a full period left at the end of an effect will do a tick of damage or healing in proportion to the remaining time. In other words, there are no more Haste breakpoints; Haste now smoothly and accurately affects periodic effects for the entire duration. "In other words, there are no more Haste breakpoints; Haste now smoothly and accurately affects periodic effects for the entire duration." This also opened up the opportunity to revise how we handle refreshing periodic effects. For the vast majority of spells and abilities, we had a standard rule that any refresh would add the new cast's duration after the next tick of the existing effect. In simpler terms, you can refresh anywhere between the last and second-to-last tick of a DoT or HoT with no loss. Warlocks had a special passive that changed this logic to allow refreshing with no loss anywhere in the last 50% of a DoT. We liked the flexibility that this provided; though felt it was a bit too powerful. No longer tied to whole tick times, we chose to extend the mechanic that Warlocks had to all classes, but reduce it to 30%. Everyone can now refresh their periodic effects anywhere in the last 30% of the duration for full benefit, and no lost tick time. Recasting periodic damage over time and healing over time effects that are already on the target now extends those effects to up to 130% of the normal duration of the effect. The changes to tanking made in Mists of Pandaria turned out quite well, overall. But there were a few rough parts that we're going to smooth over. The biggest one is the offensive capabilities of Vengeance. We like that tanks can provide meaningful DPS to their group, however, it swung wildly based on the fight, even surpassing the dedicated damage dealers occasionally. To solve this, we're going to remove the offensive value of Vengeance, but preserve the defensive value, by making it increase the effect of your active mitigation buttons, instead of Attack Power. Then, to keep tank DPS meaningful, we'll be raising their damage, since it would be meager with no Vengeance Attack Power (Vengeance accounted for 70-90% of a tank's damage on high-tank-damage fights in Mists). To do that, we're increasing the damage of several prominent tank abilities, as well as having tanks also gain increased Attack Power from Mastery, in addition to the stat’s existing benefits. That also helps keep secondary stats balanced in offensive value for them. Mastery: Blood Shield now also passively increases Attack Power by 8% (percentage increased by Mastery), in addition to its current effects. Mastery: Primal Tenacity now also passively increases Attack Power by 8% (percentage increased by Mastery), in addition to its current effects. Mastery: Elusive Brawler now also passively increases Attack Power by 8% (percentage increased by Mastery), in addition to its current effects. Brewmasters no longer deal 15% less damage. Mastery: Divine Bulwark now also passively increases Attack Power by 8% (percentage increased by Mastery), in addition to its current effects. Strict facing requirements can be frustrating to deal with, especially in hectic Raid combat or PvP environments. In order to ease this frustration, we decided to remove or significantly loosen the facing requirements of all attacks that required the player to be behind their target. Druid: Ravage no longer requires the Druid to be behind the target. The original intent behind Reforging was to offer a way for players to customize their gear, but in practice it offered little in the way of true choice. Players attempting to optimize every piece of gear were well advised to look up how they were supposed to reforge an item in an online guide or tool that had already determined the optimal choice. It added yet another step to the list of things that must be done to a new item before it was ready to be equipped, reducing the joy of getting an upgrade into a chore. If an upgrade drops, we want you to be able to equip it with a minimum of fuss. It is for those reasons that we’re removing Reforging from the game. Combat resurrections are an extremely powerful tool that players have while in combat. Naturally, we apply some limitations. In Mists of Pandaria, that limit was 1 resurrection during a given raid boss encounter for 10-player modes and 3 for 25-player modes. With Flexible difficulty introduced in Patch 5.4, we erred on the forgiving side, and gave Flexible Raids 3 resurrections regardless of raid size. In Warlords of Draenor, the Flex tech has expanded to more difficulty levels, and we needed a new system to handle combat resurrections more fairly. We knew that continuing with a constant 3 would encourage using the smallest possible raid sizes, while scaling with hard breakpoints would discourage specific group sizes just under those points. Additionally, the limit is not shown anywhere in-game, so it can be easy to lose track of how many resurrections the raid has available (or even know that the limit exists). So we’ve built a new system to be more transparent, and improve usability. During a boss encounter, all combat resurrection spells now share a single raid-wide pool of charges that’s visible on the action bar button. Upon engaging a boss, all combat resurrection spells will have their cooldowns reset and begin with 1 charge. Charges will accumulate at a rate of 1 per (90/RaidSize) minutes. Example 1: A 10-player raid will accumulate 1 charge every 9 minutes (90/10 = 9). Example 2: A 20-player raid will accumulate 1 charge every 4.5 minutes (90/20 = 4.5). A charge will only be deducted when a combat resurrection is successful (when the target accepts the resurrection). Raid frames now show a debuff indicating that a dead player has a pending combat resurrection available. Outside of raid boss encounters, combat resurrection spells retain their normal cooldown behavior. We made several improvements to the Glyph system. While leveling, characters unlock Glyph slots at several specific levels. However, in order to get glyphs, characters need to visit an Auction House (and potentially pay way more gold than an average character of that level has yet), or know a Scribe from which to request them. To solve this, we've made characters learn some Glyphs automatically as they level. Additionally, we now have the ability to make some glyphs exclusive with each other, or require specific specializations. Many glyphs have been removed, and many new glyphs have been added. Exclusive categories have been added for some glyphs. Other glyphs from the same category cannot be applied at the same time. Some glyphs are now exclusive to a specialization. Some of our goals with Professions in Warlords of Draenor are to make them more of a personal choice, and less of a mandatory “min/max” selection. To that end, we're removing the direct combat benefits of Professions. Additionally, we've made it easier to level Mining and Herbalism. Healing Potions have gone mostly unused lately, compared to combat stat potions. We chose to solve that problem, along with a problem with Warlock utility, by having Healing Potions and Healthstones share cooldowns. Movement Speed enchants now increase Movement Speed by 10% (up from 8%). A few things have happened for Death Knights. As described above in Ability Pruning, several cooldowns were made spec-specific. Rotations remain unchanged for the most part. One thing we did polish up is the effect of Diseases on the damage of other abilities. Diseases now do enough damage on their own to warrant using them, so having them act as multipliers on the damage of other abilities was extraneous, and just cluttered up the tooltips of those abilities. We removed those multipliers, and just baked in their benefit to the corresponding base spell. This slightly reduces ramp-up time. Blood Boil damage has been increased by 50%, but no longer deals additional damage to targets affected by Blood Plague or Frost Fever. Heart Strike damage has been increased by 30%, but no longer deals additional damage for each disease present on the target. Obliterate now deals 25% more damage on both main- and off-hand weapons, but no longer deals additional damage for each disease present on the target. Scourge Strike no longer deals additional damage for each disease present on the target. The ability now deals 50% of the Physical damage dealt as additional Shadow damage; this effect can critically hit and no longer ignores modifiers. In order to better balance the scaling rates and value of secondary stats for Unholy Death Knights, we reduced the power of their passive Unholy Might ability. Unholy Might (Unholy) bonus changed from +35% to +10%. Active Mitigation was a very successful design that was inspired by Death Knights' tanking style. However, it went beyond that, and Death Knights themselves were somewhat left behind in that regard. We made several changes to bring up the interactivity of Blood combat. This includes making Death Strike cause healing based on attack power, but be affected by the new Resolve passive (see Tank Vengeance and Resolve, above), which gives it the traditional increase from recent damage. Plus, Rune Tap is being significantly improved, to become a strong Active Mitigation button. To tie those together, Blood's Mastery is being changed to affect both the size of the Blood Shield absorb, and the new Rune Shield absorb. Additionally, we removed Dodge and Parry from gear, and expect Blood Death Knights to value Haste and Crit as important secondary stats. In order to achieve that, we made Riposte give defensive value to Critical Strikes, and Scent of Blood give defensive value to Multistrike. auto attack and Rune Strike crits. To solve GCD-capping issues and increase the value of Haste, we also removed the passive rune regeneration increase from Improved Blood Presence. Finally, we tweaked the targeting AI of Dancing Rune Weapon, and fixed it up to properly copy most Talents that you know. Riposte now gives the Death Knight Parry equal to their Critical Strike bonus from gear. After getting a Critical Strike with an Auto Attack or Rune Strike, you gain +100% Parry chance until you Parry an attack. This can stack up to 2 times. Improved Blood Presence no longer increases rune regeneration rate. There were also a few other miscellaneous changes. The Runic Power generation of Anti-Magic Shell was standardized, to make it more understandable and balanced. Level-60 and Level-75 talent rows have swapped places, so the important rune regeneration talents could be acquired earlier. Level-60 and Level-75 talent rows have swapped places. Guardian Druids received a number of changes. They've had increased Armor as their Mastery for a while now. However, one of the new secondary stats available to all tanks is Bonus Armor. We didn't feel that the difference of being additive vs. being a multiplier was significant enough to warrant keeping their Mastery around. Additionally, active mitigation hasn't played out as well for Guardians as it has for some other tanks. We decided to redesign the Mastery for Guardian Druids to something that compliments the Avoidance-heavy nature of Savage Defense, and also to improve the usability of Tooth and Claw for more consistent damage reduction. Note that Primal Tenacity's calculation uses the damage before any other absorbs you have, and before Tooth and Claw's effects, so that it isn’t negatively affected by any of those. Note that Primal Tenacity's calculation uses the damage before any other absorbs you have, and before Tooth and Claw's effects, so that it isn’t negatively affected by any of the changes. We also slightly reduced the power of Primal Fury, in order to better balance secondary stats for Guardians. Rage for Guardian Druids has been problematic throughout Mists of Pandaria. Most of their rage generation was extremely passive, and most of their button presses either didn't affect their survivability, or only trivially did so. We made changes to Haste and Crit, to try to solve these rage generation problems, and improve their rotation. We also added Ursa Major, in order to give a defensive value to the new Multistrike stat. Tooth and Claw can now accumulate 2 charges, and its effects stack on the target. Its effects are affected by Resolve. Ursa Major: Multistrikes from auto attacks and Mangle grant the Druid Ursa Major. Ursa Major increases maximum health by 5% for 15 seconds. When this effect is refreshed, the remaining portion is added to the new effect. Feral Druids received one major change, and few tweaks beyond what's been mentioned above in Ability Pruning and Facing Requirements. Combo Points are now stored "on the player", meaning that when you switch targets, any accumulated Combo Points remain with you. Pounce was buffed significantly, in order to bring it up to par with Ravage. Primal Fury was changed to let it affect area attacks as well. Glyph of Savagery was reworked to better achieve its intended effect. Combo Points for Feral Druids are now shared across all targets, and are no longer lost when switching targets. Overall, we are happy with Balance's rotation, however there are a few tweaks coming through Draenor Perks. With the changes to Periodic Effects, we're slightly modifying Eclipse to allow it to retain the gameplay it had before. Eclipse now increases the damage of all Nature spells (or Arcane, depending on which Eclipse state is active) cast while it is active. This means that for example: a Moonfire cast during Eclipse will receive the Eclipse benefit through its whole duration, even after leaving Eclipse. The reverse also holds true; a Moonfire cast before entering Eclipse will not benefit from that Eclipse until it is recast. And the Druid changes are capped off by merging Glyph of Stampede's effects into Glyph of Stampeding Roar. Glyph of Stampede has been removed. Its effects have been merged into Glyph of Stampeding Roar. We did a comprehensive pass on Hunter pet abilities. As mentioned above in Crowd Control and Diminishing Returns, all full crowd-control abilities have been removed from Hunter pets and replaced those with new abilities, including spreading some that were previously restricted to exotic pets. Additionally, Hunters can now tame beasts from new pet families. Hunters may now tame beasts from 3 new pet families. Abilities unique to each hunter pet family have been revised to provide a standard buff, debuff, or ability. The following pet families also provide an additional ability. Chimaera - Froststorm Breath: Causes Froststorm damage to all targets in front of the Chimaera over 8 sec. Core Hound - Molten Hide: Causes Fire damage to attackers. Devilsaur - Feast: The devilsaur feasts on a nearby Humanoid or Beast corpse within 5 yards, healing it for 20% of its maximum health and restoring 20 focus over 5 sec. Direhorn - Reflective Armor Plating: Deflects all spells cast in front of the Direhorn for 6 seconds. Hook Wasp - Flutter: Slows the fall speed of both itself and the hunter for 30 seconds. Spirit Beast - Spirit Mend: Heals the target ally instantly, and additional healing over 10 seconds. Water Strider - Surface Trot: Allows the Hunter and the Water Strider to walk across water. Worm - Burrow Attack: Deals Nature damage to nearby enemies over 8 seconds. There were also a few other changes, primarily for quality of life and rotational consistency. Aimed Shot now deals 20% more damage and can be cast while moving. no longer interrupts Auto Attacks. Growl now has a 30-yard range. Several raid buffs provided by pets have been changed into auras that are automatically applied to the Hunter's party or raid. In order to solve all of these problems, we decided to merge the 3 current Bomb Talents into one that changes based on spec. That allows us to reintroduce spec-specific perks to each Bomb, and makes room for some non-DoT alternatives. Nether Tempest, Living Bomb, and Frost Bomb are now available to their corresponding specialization only, and share the left Talent slot. Frost Bomb has been redesigned. It now lasts 12 seconds, has no cooldown, and explodes every time the target is critically hit by the Mage's Ice Lance while frozen. The damage per explosion has been reduced by 75% to compensate. One of the most problematic Talent rows in the game has been the Mage level-90 row. The primary theme of the row was mana, which only Arcane Mages actually cared about. Bonus damage was added in, making it functional for all Mages, but muddled in its goals. Additionally, some of them just weren't fun to play with. We've revised the row to be purely about damage, and made them have less maintenance cost. Arcane Mages will have enough mana regeneration without these Talents to perform well. Glyph of Mirror Image has been removed and its effects have been incorporated into Mirror Image. Frost Mages enjoyed newfound PvE viability in Mists of Pandaria, and we intend to continue that into the future. However, we do want to clean up some rough spots, especially around their valuing of secondary stats, and the amount of instant-cast spells in their rotation. The Frost Armor and Shatter changes increase the amount of Haste/Critical chance that they can acquire on gear before they start hitting soft caps. The Shatter change also lowers the value of Critical Strike for a bit. The changes to the level-75 Talent row meant that having a Bomb spell is no longer guaranteed, so we changed the way that Brain Freeze is triggered. We also changed Brain Freeze's effect, in order to give Frost mages another cast-time spell in their rotation. Glyph of Frostfire Bolt is now available only to Fire Mages. Having two play styles in one spec (Eminence, and traditional Mistweaving, healing primarily through casting heals) proved challenging to balance, because we don't want players to take the best parts of both and stack them into an unintended superior spec. The most notorious of these cases was "Jab-Jab-Uplift". In order to solve this problem, we're giving Mistweavers two stances. Stance of the Wise Serpent will continue to be the stance from which to do traditional Mistweaving. The new Stance of the Spirited Crane will be the stance to use for Eminence. You can swap stances at will, with only the cost of a GCD and any current Chi that you've accrued. The intention is that Crane Stance allows Mistweavers to trade healing for damage; it should fall somewhere in the middle between being a full healer, and being a full damage dealer. Stance of the Spirited Crane is a new ability for Mistweaver Monks, which replaces Stance of the Fierce Tiger. The Spell-Power-to-Attack-Power conversion effect has been moved from Stance of the Wise Serpent to Stance of the Spirited Crane. The Eminence effect has been moved from Stance of the Wise Serpent to Stance of the Spirited Crane. Eminence now a nearby target to be healed for 35% of all damage caused by the Monk and includes auto attacks. Serpent's Zeal has been removed. Eminence now always includes Auto Attacks. Muscle Memory, Serpent's Zeal, and Vital Mists have been replaced with a new passive ability, Crane Style Techniques. Crane Style Techniques enhances several of the Monk's combat abilities while in Crane Stance. merged. Muscle Memory now requires Stance of the Spirited Crane, and passively increases the damage of Crackling Jade Lightning by 100%, causes Tiger Palm to trigger the Vital Mists effect, and causes Blackout Kick to hit 4 additional nearby targets for 50% damage. Crackling Jade Lightning channels 150% faster, generates 1 Chi each time it deals damage, but costs 300% more mana. Blackout Kicks grants Crane's Zeal, increasing Critical Strike chance by 20% for 20 seconds. Blackout Kick causes Eminence to heal 5 allies instead of 1, but heals for only 15% of damage dealt instead of 35%. The Monk gains a stack of Vital Mists for every Chi consumed. Rising Sun Kick is now available to Mistweaver and Windwalker Monks. However, it does not cause Mortal Wounds for Mistweavers. The Windwalker passive ability, Combat Conditioning, now causes Rising Sun Kick to cause Mortal Wounds, instead of causing Mortal Wounds naturally. We also did some polishing on Brewmasters and Windwalkers and made Storm, Earth, and Fire, Transcendence, and Touch of Death easier to use. Fists of Fury has also been improved; sometimes brute force is the right answer. Gift of the Ox was changed to give value to the new Multistrike stat for Brewmasters. Lastly, Tiger Strikes was improved considerably, and made available to all Monk specializations. Gift of the Ox now has a chance to trigger only from auto attack Multistrikes, instead of from all auto attacks. It has a 100% chance to trigger while using a two-handed weapon, and a 62.5% chance to trigger while dual wielding. Fists of Fury now deals 100% increased damage, and always deals full damage to your primary target; additional targets are still affected by the damage split. Tiger Strikes is now available to all Monk specializations, and has a chance to trigger on successful auto attacks and their Multistrikes. It has an 8% chance to trigger while using a two-handed weapon, and a 5% chance to trigger while dual wielding. When triggered, Tiger Strikes now grants +50% Multistrike for 8 seconds instead of +50% attack speed and double attacks for 4 attacks. We made several changes for Holy, to go along with other larger system changes to compensate for the removal of Guardian of Ancient Kings from Holy, and merged its benefits into Divine Favor. In order to follow through on our change to merge all types of Haste %, we removed the Spell Haste % from Seal of Insight to a Holy-only passive, so that it didn't also increase Protection's baseline Haste by 10%. Our changes to healer mana and mobility also indirectly increased the value of Selfless Healer by a large amount, so we brought it back down to be even in power with the other talents on its row. We also raised the range of Denounce to be consistent with other spells. Infusion of Light now also passively increases Haste by 10%. Seal of Insight no longer increases spell Haste by 10%. Selfless Healer for Holy no longer causes Judgment to grant Holy Power. It also is only usable on Flash of Light, no longer on Holy Light or Holy Radiance. For Protection, we tweaked Eternal Flame in order to reduce its massive self-healing amount, and provide better balance between talents on that row. We also added a new passive, Shining Protector, in order to give defensive value to the new Multistrike stat. Bastion of Glory no longer affects the periodic healing of Eternal Flame. It still affects the direct healing portion of the ability. Shining Protector is a new passive ability for Protection Paladins. Shining Protector: All heals you receive have a chance equal to your Multistrike chance to trigger Shining Protector, healing you for an additional 30% of the triggering heal. Eternal Flame now deals 100% of the direct healing of Word of Glory (up from 70%), but only 50% as much periodic healing as before. Additionally, Bastion of Glory no longer affects the periodic healing. We made a few additional changes to Paladins. We revised the functionality of Hammer of the Righteous a bit, such that its performance is about the same, but its tooltip is much clearer. We also made Stay of Execution much more attractive to use as an emergency button. One big change for Retribution that isn't mentioned here is the removal of Inquisition (see Ability Pruning), which will have a notable effect on their rotation. There are a few other miscellaneous changes. One is a quality-of-life change for healing Priests. The other is a fix for a problem with Void Tendrils, where it lasts its full duration against creatures that had no way to attack it (such as in certain Raid encounters). Note that the health reduction is to keep it where it was in health, compared to player health doubling. The third is an efficient AoE healing spell for Discipline Priests. Angelic Feathers, if cast on players, will always prefer the casting priest over others, then pick the player closest to the targeted location. If there are no players where it is targeted, it will still create a feather that can be picked up, as before. Additionally, when collecting multiple feathers, the duration will be extended instead of replaced; up to a maximum of 130% of base duration. Inner Focus: No longer provides immunity to Dispels, Interrupts, and Silences. This effect will be returning as a Major Glyph. Purify, Halo, Cascade, and Divine Star can now be cast while in Spirit of Redemption form. Shadowfiend no longer restores mana. Mindbender now restores 0.75% mana per hit (down from 1.75%). There are a number of Rogue changes listed under Ability Pruning, but there are a few additional changes to note. The biggest of which is a fundamental change to how Combo Points work. They're now shared across all enemies; you can swap targets and you won;t lose your Combo Points. First, in our efforts to reduce cooldown stacking across the game, we chose to remove the damage increase from Tricks of the Trade. And second, we decided to loosen the weapon requirements on Assassination. It's important to note that we still intend for daggers to be the optimal choice for Assassination Rogues, but this change will help Rogues who want to try out Assassination but don't have two daggers. Combo Points for Rogues are now shared across all targets. You no longer lose your Combo Points when switching targets. In Warlords of Draenor, we're pulling back on the ability for many casters to deal damage while moving, and that includes Elemental. They will still have some ability to deal damage while moving, through Shocks, Unleash Weapon, and instant Lava Bursts. For Chain Lightning, we wanted to reduce the impact of Haste soft capping, and so changed Shamanism to increase damage instead of reduce cast time. Additionally, we simplified Wind Shear by removing its impact on threat, which no longer matters. Ascendance for the Enhancement specialization now changes the Shaman's auto attacks and Stormstrike to deal Wind-based physical damage that bypasses armor. Earthquake damage has been increased by 36%. Echo of the Elements has been redesigned. The Shaman's spells and abilities have a chance to trigger Echo of the Elements, causing their next short-cooldown spell or ability to not trigger a cooldown. Elemental: It may be used on Earth Shock, Flame Shock, Frost Shock, Earthquake, or Lava Burst. Enhancement: It may be used on Earth Shock, Flame Shock, Frost Shock, Fire Nova, Lava Lash, or Stormstrike. Restoration: It may be used on Healing Rain, Purify Spirit, or Riptide. Using Unleashed Fury with Windfury Weapon imbue active now increases Multistrike chance by 10%. Haste has long been a problematic stat for Warriors, usually being of little value. As part of our commitment to ensuring all secondary stats are valuable (except Bonus Armor for non-tanks and Spirit for non-healers, of course), we're making a significant change to Warriors, to ensure that Haste has strong, competitive value. We're giving all Warriors a new passive, which lets haste affect their global cooldown, and the cooldowns of their very-short-cooldown rotational abilities. Sudden Death can no longer trigger from Opportunity Strikes. Protection Warriors have received a few notable changes. First, we removed Dodge and Parry from gear, and expect Protection Warriors to value Haste and Crit as important secondary stats. In order to achieve that, we made Riposte give defensive value to Crits. The aforementioned Headlong Rush also helps for valuing Haste. Blood Craze is a new passive ability for Protection Warriors. Blood Craze causes Multistrike auto attacks to trigger a Blood Craze, which regenerates 3% of the Warrior's health over 3 seconds. When this effect is refreshed, the remaining duration is added to the new effect. Riposte now gives the Warrior Parry equal to their Critical Strike bonus from gear. gives the Warrior +100% to Parry chance until they Parry an attack after getting a critical strike with an Auto Attack. Es lohnt sich wirklich die Patchnotes mal zu lesen. In dem Addon steckt mal wieder so viel Gutes, dass mein kleines Raider-(und Raidleiter)-Herz bei mehreren Passagen einen kleinen bis großen Luftsprung machte. Ich hatte ja 2010 schon Ideen zur Lösung des "Manamanagement spielt keine Rolle für Heiler"-Problems und freue mich natürlich umso mehr, dass Blizzard nun genau diesen Weg einschlägt und Willenskraft als inflationär zu erhaltenden "automatischen" Stat in der Itemprogression entfernt. Es noch hier und da im Sinne der +Armor (die wir bei den Tanks schon in Icecrown erlebt haben) anzubieten finde ich eine nette Idee. Ich vermute mal, dass sie auch Spirit-Gems entfernen - das wäre jedenfalls notwendig. Mit den angedachten Änderungen hat Blizzard nun endlich die Voraussetzungen geschaffen, dass Mana nicht nur zu Beginn des ersten Tiers eines Addons zum Abwägen der Spell-Wahl der Heiler zwingt, sondern konstant ein wichtiger Faktor bleibt. Auch die Entfernung einiger Raid-CDs oder wenigstens deren Abschwächung trägt dazu bei, dass die Heiler auch mal wieder spannende Raid-dmg-Sitationen erleben, die ohne die richtigen CDs unheilbar sind. Die Änderung dürfte auch den notwendigen Rahmen dafür geben, dass man gegen Ende des Addons nicht nur noch frustriert ins Raidframe klickt, weil die Spieler entweder fatalen (tödlichen) Schaden erleiden oder eben ständig auf 100% Leben rumdümpeln. Man würde wieder mehr Raum fürs Heilen (und reaktiv macht das eben doch mehr Spaß als proaktiv, für den Fall, dass...) schaffen und dadurch vielleicht auch insgesamt Encounter wie die Klaxxi vermeiden, in denen kleine Fehler für jeden Einzelnen direkt tödlich enden (müssen). Schaut euch aber auch die anderen Notes an; ist für alle Rollen was wichtiges dabei. Mir sind vor allem die klassenspezifischen Änderungen ins Auge gestochen. Man (oder ich) fühle mich bei so komplexen Gedankengängen seitens Blizzard als Konsument richtig wertgeschätzt. Es muss ja auch irgendwelche Dinge außerhalb der Raids geben die etwas anspruchsvoller sind, um Vielspieler bei der Stange zu halten. Endloses Ruf, Punkte, Mounts, Pets und Moggs farmen hat keine längerfristige Qualität. Ich denke so grundlegende Dinge wie Max anspricht kann man erst kurz vor dem Release wirklich beurteilen. Solange es Hard+Fast Hitter gibt, die einen Tank in weniger als 2 sek von 100 auf 0 bringen, solange kann man nicht ernsthaft Mana als limitierende Ressource bringen um das Heilen "anspruchsvoller" zu gestalten. Ganz zu schweigen von der Problematik von Druiden und Monks, die ja - komplett unabhängig von der Situation - ihre Hots oben halten müssen. Bin da also noch nicht so begeistert wie Max. Jeder Heiler bekommt einen "passiven" Dmg-Reduktions und einen "aktiven" Heal- RaidCd - dazu einen SingleTarget Def. CD. natürlich alles soweit angepasst, dass es in etwa gleich stark ist. Tanks bekommen jeweils einen defensiven RaidCd. Alle anderen CDs werden entfernt - Ddler haben keinen Zugriff auf diese Cds. Das Sie die Def CDs bei den Tanks Rausgenommen und den DDs gelassen haben verstehe ich auch nicht so ganz. Tanks und Heiler sind ja etwas das man immer hat und wenn Sie die CDs bringen kommt es nicht dazu das man Klasse X stackt um einen Heiler zu reduzieren bzw. es entsprechend einfacher wird mit Klasse X.
Das Encounter Balancing wäre einfach besser zu gestalten weil man von 5 Heiler + 2 Tank CDs ausgehen kann. Matthias: Das "Durchmähen" durch den 5er Content ist in MoP allein schon aufgrund der extremen Itemskalierung so krass wie noch nie zuvor. Bisher haben die DDs in noch keinem Addon ihre sustained DPS vom ersten bis zum letzten Tier derart vervielfacht. Ich hab beispielsweise in blauen Klamotten im ersten Tier um die 50k DPS gemacht (was ungefähr das war, was vorher in Cata in Dragonsoul in HC-Gear ging). Heute in SoO sind es über 400k Single-Target DPS, also einfach mal das Achtfache. Selbst wenn Blizzard also hier keine neuen Kniffe nutzt um 5er Content langfristig etwas fordernder zu halten, ergibt sich allein schon aus der neuen linearen (und nicht mehr exponentiellen) Itemlevel-Skalierung eine deutlich flachere Kurve. Ich vermute mal, dass wir unsere DPS zwischen dem ersten und letzten Tier vielleicht noch um 50% oder maximal um 100% steigern können. Wenn es dann noch zwischendurch neue 5er Inhalte gibt, die naturgemäß ja dann auch immer auf das jeweils aktuelle Tier getuned werden, sollte es auch wieder mit etwas mehr Hirn in den 5ern zugehen. Was sie in WoD mit dem Magier anstellen wollen, gefällt mir irgendwie nicht so wirklich...mal abwarten. Dieser Beitrag könnte Meinungen des Autors beinhalten, die nicht als solche gekennzeichnet sind. Das hört sich vernünftig und nachvollziehbar an. Ich bin gespannt wie das dann in der Realität aussehen wird, würde mich sehr freuen, wenn du Recht behältst. Das darfst du dann drücken, Vince. Bei uns passiert ma wieder nicht viel, das mit Haste hört sich ganz nett an, anscheinend wird die Prio neu gedreht. Das wars aber dann auch schon. Wo genau hast du gelesen, dass den Tank ihre CDs weggenommenm werden? Habe gerade vergeblich gesucht. Da die Bubble beim DK ein Talent ist scheint er es zu behalten. Edit: ich meinte die Raid CDs nicht die Personal falls das evntl. missverständlich ausgedrückt war.